One of my hobbies is following Sherlockian scholarship. It’s a bit dorky, but not quite as bad as being a Trekkie, particularly now, with the BBC’s Sherlock as popular as it is. One of the most fun aspects of the 'Grand Game' of Sherlockian scholarship is that it is really based on texts, not film or television. This allows for a completely different style of criticism, namely the application of biblical critical methods. In Monsignor Ronald Knox's landmark essay, “Studies inthe Literature of Sherlock Holmes,” (1911) we find historical, canonical and form critical methods, as well as an examination of the structure and symbols Dr. Watson employed to chronicle the exploits of his great friend. With such a foundation, its not surprising to see strong affinities between biblical and Sherlockian studies (even the 56 short stories and 4 novels that are of undisputed authorship are called the canon). I just posted an essay on academia.edu, which I wrote a few years ago called “The Quest for the Historical Sherlock.” In this essay I applied a Schweitzerian critique of Sherlockian scholarship, particularly on when scholars seek to uncover Holmes’ religious beliefs. 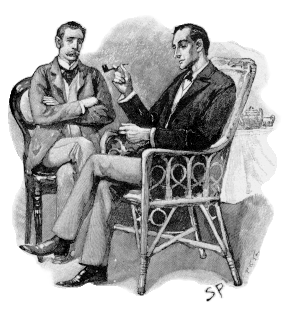 Sherlockians have a flagship society and publication, TheBaker Street Journal, which has published at least twenty articles that are in some way examining Holmes' religious views, beliefs, and/or practices. Additionally, there are several monographs, including an addition to the ubiquitous series of The Gospel According to Any-Popular-Cultural-Phenomenon. In these articles we see suggestions that Holmes is committed to agnosticism, Anglicanism, atheism, Buddhism, Catholicism, Deism, Judaism, and spiritualism. Schweitzer tells us that looking for the historical Jesus, is like looking down a well and seeing your own face reflected back at you. I think that Sherlockian scholars suffers from the same inability to read the text without the text reading them. Holmes often says things like, “it is a wicked thing to tell fibs” (3GAB) or refers to a court higher than the assizes (BOSC), but these do not seem to be genuine reflections of religious belief (after all, not everyone who exclaims, 'Oh my God!' is a theist). He only gives us one extended passage on religion. Some see this rumination as proof that Holmes was a theist. But I agree with Monsignor Knox on this one; I think Sherlock was just wasting time so that he could examine the shutters for clues.